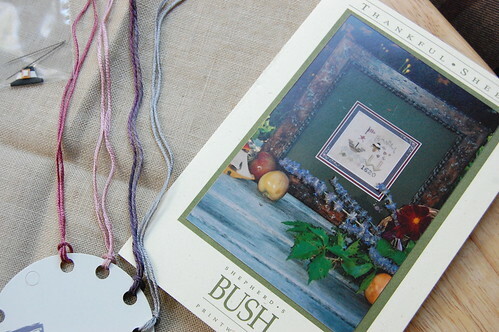 I was also going through my stash for a Thanksgiving pattern and came across this little Shepherd's Bush kit. I had sorted the silks last year, but never got around to stitching it. I'm thinking of stitching it this year. Your blog looks so pretty and new! I love it! I love Shepherd's Bush! That looks like a fun stitch for Thanksgiving! The fabrics are gorgeous! I too need to get more Days Gone By as I am on my last little bit of it here and it is a very favorite! I also just love the Autumn Gold to stitch on! My Shores of Hawk Run Hollow is being done on it and it is so nice to work on. Enjoy stitching today! and I LOVE the Shepherd's Bush! Can't wait to see it stitched! Love your new blog face!!!! Silkweaver fabbies are so nice. I'm stitching my Needle Mania on it and I'm hooked now. Love the look of your new blog! Your new fabric is pretty and your new projects are lovely. You always pick the right thing. 8 hours with 3 kids? WOW! I've never stitched or even seen Silkweaver linens. They are lovely. Thanks for showing them so I might now hunt them down. I like the new paisley wallpaper on your blog! Great fabric choices, Nicole. 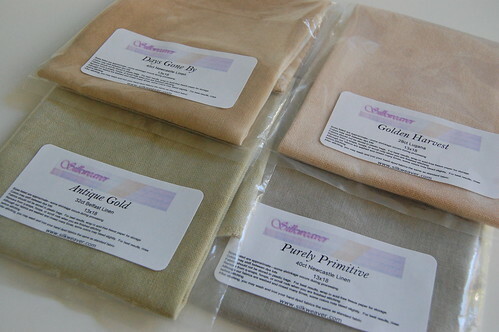 Golden Harvest looks interesting - as you know, I have purchased the other colours recently myself. Thankful Sheep is fun and quick to sitch up. You'll enjoy it. Lovely linen there I do like the colours you have chosen. Nice fabric! Can't wait to see your new Shepherd Bush progress. I'm sure it will be stitched in no time! Had dinner with Ruby the other evening, she said asked about you! Yummy stash! I like the antique gold. Looking forward to seeing what you decide to stitch on that piece. Great stash haul. The fabric colours are gorgeous.